the goals of the University, but her participation doesn’t end there. She told MarPro in February, “I try to participate in various activities at the University so that I better understand the culture and educational program and therefore its needs. Like CMA, all of the maritime academies are addressing diversity in terms of recruiting a wider variety of students. And, of course, like so many of her colleagues, Keeler is an active member of Women’s International Shipping & Trad- ing Association (WISTA), a networking organization for women at management level in the maritime industry. 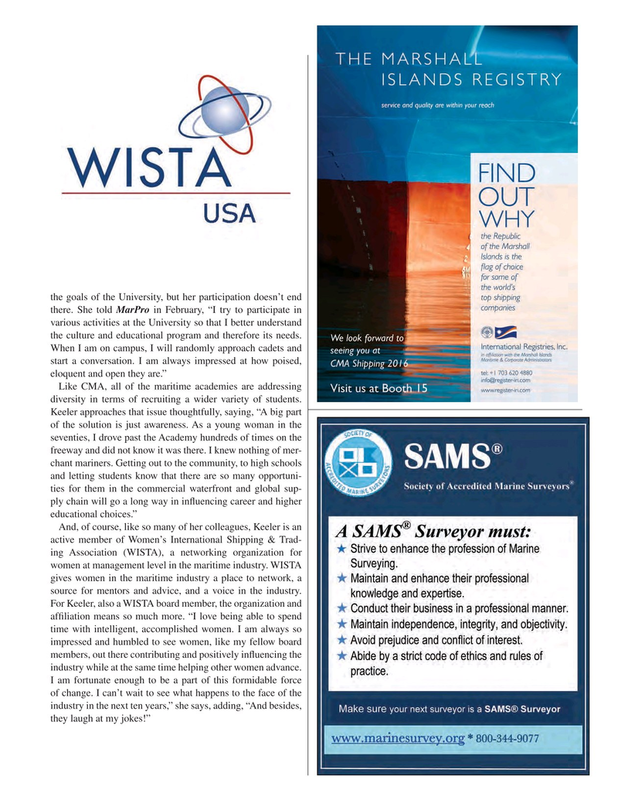 WISTA gives women in the maritime industry a place to network, a source for mentors and advice, and a voice in the industry. For Keeler, also a WISTA board member, the organization and af? liation means so much more. “I love being able to spend time with intelligent, accomplished women. I am always so impressed and humbled to see women, like my fellow board members, out there contributing and positively in? uencing the industry while at the same time helping other women advance.